Scientists in Switzerland have split carbon dioxide into separate streams of carbon monoxide and oxygen using a solar reactor. The technology uses a thermochemical process to convert carbon dioxide and water into useful fuels. Splitting carbon dioxide and water to give carbon monoxide and hydrogen gas (syngas) is the first step to producing liquid hydrocarbon fuels for cars and aeroplanes. 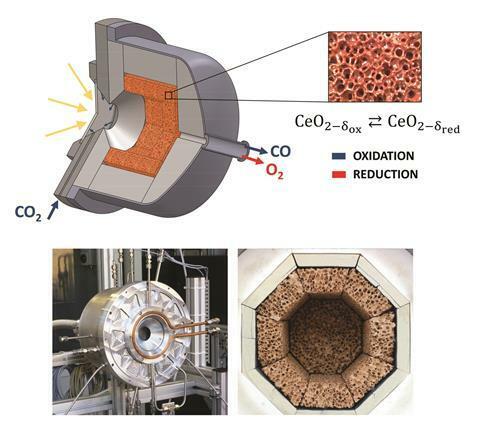 Current approaches for splitting carbon dioxide into carbon monoxide and oxygen suffer from low mass conversions, poor selectivity and low energy efficiencies. The solar reactor has a 100mm inner diameter, a 75mm deep receiver with a 4cm diameter circular aperture sealed by a 4mm thick quartz window so it can access the concentrated solar radiation. The cavity contains an octagonal 25mm thick porous ceramic structure made of pure ceria. With this arrangement, the structure is directly exposed to high-flux irradiation, enabling volumetric absorption and uniform heating. Now, a team led by Aldo Steinfeld at the Swiss Federal Institute of Technology, ETH Zurich, has made a 4kW solar reactor containing cerium oxide or ceria, a well-known redox material. The reactor can split carbon dioxide into separate streams of carbon monoxide and oxygen. The technology uses a two-step cyclic process based on the reduction and oxidation reactions of ceria and a swing in temperature and pressure to control the oxygen exchange. In the first step, 3000-fold concentrated solar power heats the ceria to 1500°C under reduced pressure to generate oxygen. In the second step, carbon dioxide reoxidises the reduced ceria at 900°C to generate carbon monoxide. This redox cycle can also split water into separate streams of hydrogen and oxygen by simply substituting carbon dioxide for water in the oxidation step. Splitting carbon dioxide into separate streams of carbon monoxide (or hydrogen) and oxygen is very important for controlling the fuel’s purity and quality. An explosive mixture forms if oxygen contaminates the fuel. Steinfeld’s technology shows 100% selectivity for carbon monoxide and oxygen, 83% molar conversion from carbon dioxide to carbon monoxide, and 5.25% solar-to-fuel energy efficiency. ‘While the reported carbon dioxide splitting process does not quite reach the efficiency of solar thermal electricity plants, for example the Ivanpah Solar Power Facility in California, it is an important step toward direct solar thermal fuel production. The reported 5.25% solar to fuel efficiency is a new record for solar thermochemical carbon dioxide splitting,’ comments Frank Osterloh, a solar energy expert from the University of California, Davis, in the US. Steinfeld and his team are now scaling the solar reactor up to work with a 50kW solar radiative power input. ‘Its large-scale industrial implementation, for example, with an array of solar reactor modules on top of a solar tower, can make use of the solar concentrating infrastructure already developed for commercial solar thermal power plants,’ he says.